The new “UA18x5.5,” “UA14x4.5” and “UA27x6.5” broadcast zoom lenses deliver 4K quality across their zoom ranges by preventing resolution degradation around the edges and controlling all types of aberrations. The “UA18x5.5” and “UA14x4.5” are portable lenses with compact and lightweight bodies for advanced mobility. 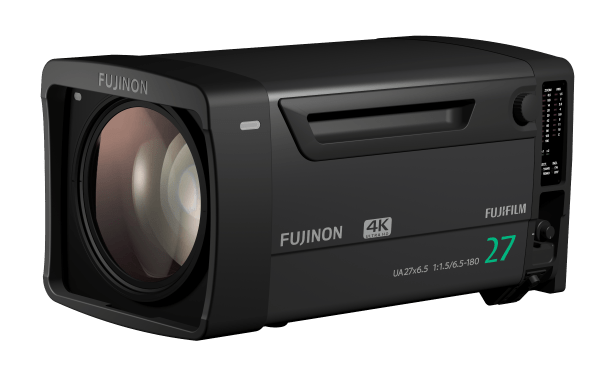 With the recent market introduction of compact and lightweight “4K camcorders,” these lenses will accommodate an increasing number of videographers who shoot while carrying 4K equipment on their shoulder. The “UA18x5.5” weighs 2.04kg and covers focal lengths from 5.5mm on the wide angle end to 100mm on the telephoto end, making it useful for production situations that require added mobility such as news reporting and on-location production. The “UA14x4.5” covers the ultra wide angle focal length of 4.5mm despite its compact body, measuring just 238.5mm, allowing you to go up close and personal during live sport coverage or on-location production with a real sense of depth. The “UA27x6.5” is a 4K-compatible 27x zoom lens, perfect for in-studio applications for news and variety shows. With the wide-angle focal length of 6.5mm, it can also be used to give a full view of a concert venue in live coverage. The “UA27x6.5” has a built-in extender*1, which doubles its focal lengths, covering up to 360mm in focal length while maintaining image quality in advanced definition. These three models will be on display at the NAB 2017 exhibition of broadcasting equipment, to be held in Las Vegas from April 24 to 27, 2017.